Gingher Stork Embroidery Scissors  - $21.50 : Yarn Tree, Your wholesale source for cross stitch supplies. Item 2955. Gingher Stork Embroidery Scissors. 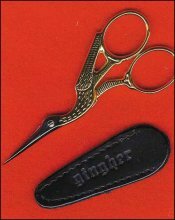 The traditional stork decorates these sharp scissors from Gingher. With their reasonable price, these 3½” scissors are a popular gift idea. Comes with leather sheath. G-ST.